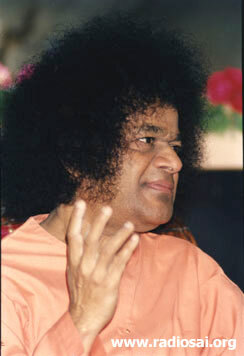 An alumna of the Anantapur campus of Sri Sathya Sai University, Ms. S. Lakshmi completed her Bachelors in Sciences in 1990. She continued in the same campus for one more year to pursue her Bachelors in Education. She has authored many books in English which includes “A Comprehensive Life Sketch of Shirdi Sai Baba” and “Venka Avadhootha”. Additionally, she has also translated “Autobiography of Peda Bottu” and “Divine Revelations” from Telugu to English. Currently, she is pursuing her Ph. D in English Literature from Sri Venkateswara University. My tryst with Divinity began long before I made my tryst with the world. 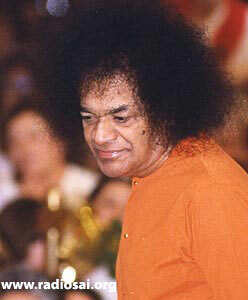 For, my mother was an ardent devotee of Bhagavan Sri Sathya Sai Baba right from her childhood. And, my father, a devout follower of Shirdi Sai Baba. I had my first darshan of Swami in Shivam, His abode in Hyderabad, even as I was on my mother’s lap, merely eight months old. 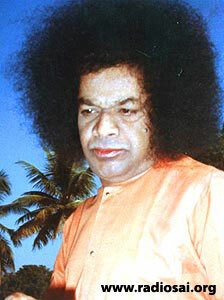 Swami blessed me and told my mother that I would be in Puttaparthi and that He would take care of me. Faith and love for God were, therefore, two things I inculcated from my very childhood, thanks to Swami’s blessings and my two wonderful parents. Even as a child, I loved my father very much, and therefore had great love for Shirdi Baba. My father taught me how to do japa (chanting His name) and dhyana (meditation). Shirdi Baba would even appear in my dreams and talk to me. My faith in God grew as I felt His constant presence, ready to guide and guard me. When I completed school, my grandfather passed away. This was my first personal experience with death. The pain and anguish of losing a beloved grandparent left a deep vacuum within me, an emptiness that sought to be consoled and comforted. I prayed to God for solace, that He grant me the understanding and fortitude to accept the inexorable reality. That was His clarion call to me. And I simply knew that I wanted to be with Him. I told my father that I wanted to apply to Swami’s college at Anantapur, while my father wanted me to pursue Engineering. I did not want to disappoint him either so I wrote the Engineering Entrance Examination too. I got through both. However, by Bhagavan’s grace, my father agreed to send me to the Anantapur Campus of Sri Sathya Sai University. This could happen only because Bhagavan had willed it so. For hadn’t He promised my mother when I was an infant? Wonder of wonders, the day I joined Swami’s college in Anantapur, I was put in Room No. 43! I had barely come out of my elation, when, within minutes, an announcement was made saying that Swami had called all of us to Puttaparthi. My joy knew no bounds. And even before we knew, we were all seated in the mandir, waiting for His darshan. As soon as I saw Him coming out, I started reciting a prayer within my heart... (O Lord! You are my mother and You are my father. You are my relative and You are my friend too. You are knowledge and wealth unto me. You are my all-in-all, O Lord Sai). Bhagavan came, stood in front of me, and said, “You are my mother. You are my father. What is all this? Who are you? And Who am I?” What a statement! I could only exult in His nectarine omniscience, and bowed down to Him. That evening, I saw Bhagavan for the first time in the holy abode of Puttaparthi. As soon as I saw Him coming out, I started reciting a prayer within my heart, a prayer that my mother had taught me as a child – Tvameva mata cha pita tvameva, Tvameva bandhuscha sakha tvameva, Tvameva vidya dravinam tvameva, Tvameva sarvam mama sai deva (O Lord! You are my mother and You are my father. You are my relative and You are my friend too. You are knowledge and wealth unto me. You are my all-in-all, O Lord Sai). Bhagavan came, stood in front of me, and said, “You are my mother. You are my father. What is all this? Who are you? And Who am I?” What a statement! I could only exult in His nectarine omniscience, and bowed down to Him. Life in the college was beautiful. For even as I imbibed academic lessons, prescribed by the college syllabi, Bhagavan, the Universal Chancellor, was painstakingly teaching me a lesson or two from the Cosmic Syllabi – priceless personal lessons in concepts of the Divine Doership and the Desirability of Surrender. To share an instance, I was very timid by nature. I was afraid of talking to even a group of four people. Once, it so happened that I was to give a prayer talk in the college auditorium. I tried my best to wriggle out of my difficult situation but to no avail. As the D-day approached, my anxiety grew intense and so did my prayers. The Compassionate Lord appeared in my dream, and said, “You stand. I shall speak.” In the dream, Swami actually made me speak even as He told me what I should be saying, and in what sequence. I got up in the morning, relieved and thrilled, and jotted down all that Swami had told me. Needless to say, the prayer talk was well-received, not only because Swami had authored the content, but also because I had spoken in the comforting knowledge that it was not me but He who was speaking, that I was merely a mouthpiece of the Divine Flutist. And that to me, was a big lesson from Bhagavan on the sweetness of surrender; that I was just an instrument in His hands, and He was the Doer. And if a little trace of fear remained within, Swami removed even that completely, by advising me, on another occasion. He said, “You are neither a beast to scare others nor an animal to be afraid of someone. Always keep repeating ‘I am God’.” That statement from Bhagavan gave me lot of self-confidence. And one of its several benefits has been to exorcise my fear of public speaking, transforming it, instead, into a thrilling exercise in advaitic surrender! Swami’s nectarine lessons did not end with our stay as students. He continued to give us glimpses into His enlightening omniscience, even as we had completed our studies and had returned joyfully to attend the Summer Course in Indian Culture and Spirituality. In fact, Swami Himself had invited us, outgoing students, to the Summer Course, which He said He would be reviving again from that year. The year was 1991. During the Summer Course, in the afternoons, Swami would pass through our dining hall, go through a particular door into the boys’ hostel, have His meal there, and return via the same door. We all scrambled to sit near that door as Swami usually spoke to the first girl sitting there, asking questions like “What is the curry?” or “Is everything tasty?” or “Are you eating in the first batch or second batch?” and so on. Bitten by the Divine frenzy, I too would rush to occupy that coveted spot, and secure for myself the first place. He Knows Even the Rasam! One day, I noticed that the rasam (a south Indian side dish) looked like tap water sprinkled with chilly powder. Nevertheless, when I sat to have my lunch, I found the rasam so tasty that I kept licking my fingers. That day, I missed the first place and was second in line. Within a short while, Swami came and asked the first girl, “What is the curry today?” She replied, “Rajma” and Swami joked, “Oh Rajmatha!” I was feeling bad as He would not talk to me that day. Hardly had the thought crossed my mind, Swami, who was now standing before the third girl, turned back and asked me, “Hey! Rasam Kaisa Hai (How was the rasam)?” I immediately said, “Very tasty Swami.” Swami made a mischievous face and said impishly, “Tap water! Chilly powder!” He knew what I thought in my heart, the very words! I learnt the delectable lesson never to criticize food even in my thoughts. Food was God, and criticizing food was tantamount to criticizing God. Even if I did, He would know it instantly! For, there was nothing one could hide from the All-knowing Bhagavan. When I completed studies in June 1991, I was fortunate enough to be selected by Bhagavan, among ten others, to work in His Super Speciality Hospital at Puttaparthi, which was to be inaugurated in November that year. Bhagavan gave us an interview, and then sent us to Brindavan to undergo a four months’ training program at various hospitals in Bangalore. Food and transportation too were arranged by Bhagavan. Not just that, Swami told us that He would personally come to see how we were progressing with our training, and even asked us to write letters to Him once a week. So it was that the ten of us were accommodated in a spacious cottage. We had a huge hall to sleep in and also a store room to keep our belongings. The hall had two fans running at full speed, and I slept right under one of them. One night, while I was fast asleep, I dreamt that something was falling on me, and I was simply repeating Swami's name. Meanwhile, my friends tried to wake me up, and I got up wondering why they had to disturb me from a deep sleep. That is when I realized that the fan had actually fallen on me! I had felt a warm sensation but nothing else had happened. Instead, it seemed as if the fan had borne the brunt of the fall. Two of the blades were bent in an L-shape, while the other one was straight. “Grace is there. If not, when the fan fell, your neck would have been chopped off. You have written that Brindavan song and also that Swami does not talk to you, look at you and does not bother about you. If I am not always with you, then who do you think protected you? Is it possible to bend the blades of the fan in an L-shape?” He continued, pointing at me, “You were sleeping like a buffalo, not bothering to see if the nuts and bolts are tight or not. Never say that Swami is not with you. " Moreover, the fan was carefully placed away, as if to avoid any injury to my body. In fact, I was the only one who had heard nothing. Our neighbours had all come running, when they heard the loud thud. They all said that I should thank Swami for saving my life. But I took the incident for granted, and neither thanked Swami nor mentioned the incident in my weekly letters to Him. Instead, I slept as ever, peaceful, unmindful of the entire episode. And, over a period of time, I totally forgot about the incident. 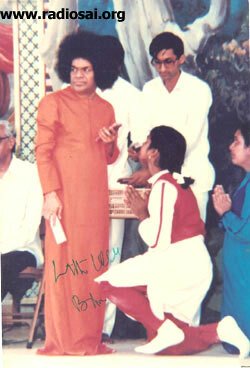 A few weeks later, Swami came to Brindavan. But our training program was such that a van would come to pick us up from the ashram and take us to the city at 6.30 a.m. sharp. And we would return to the ashram at around 6 in the evening. That meant, we missed both morning and evening darshans. 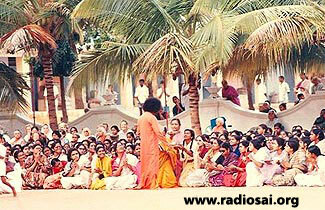 Though we were living in the ashram, right behind Swami's residence, we could not see Swami for two days. Our hearts longed for Swami’s darshan. And we poured out our hearts to Him through letters in which we reproached Swami for not looking at us, not talking to us, not concerned about us, and so on. We even quoted a song Brindavanam adi andaridi govindudu andari vadene (the Krishna of Brindavan belongs to all). But we berated Swami as kondari vadene meaning (belonging to only a few). On the following day, we were desperate to have Swami’s darshan, even if it meant missing out on our Hospital visit. So we prayed hard so that our van would not turn up and take us away. The all-merciful Bhagavan would have arrested the movement of the vehicle somewhere, for even at 8.30 a.m., there was still no sign of the van. Meanwhile, the darshan music had started. So, we requested a lady volunteer to permit us to sit near the gate. This gate is exactly opposite to the one which Swami uses for going out to give darshan. There were only animals gamboling near our gate. We knew that Swami would never look at our side but we were feeling wonderful to see Him, at least, from that distance. "I am always with you, in you, around you, above you, below you"
As we sat watching the rabbits and deer, Swami came out and looked at us. We were thrilled that He had noticed us from that distance. Swami then went on to the other side of the Trayee gate to give darshan, and asked the volunteer, “Why did you make My children sit near that gate there? They are My children, and they should be sitting on the V.I.P lawn.” That was Swami’s love for His students, His property. I did not open my mouth after that. I was grateful to Bhagavan for giving me a new life. I then decided that this life given by Him should be lived only for Him. And ever since that day, I stopped taking things for granted and started thanking Him for each and everything in my life. Truly, a major lesson in gratitude. On another occasion, Swami visited the Hospital and asked out of the blue, “Where is prana (life force)?” Each one gave a different answer. But Swami was not satisfied. Finally, He gave the correct answer Himself, Neelatho yada madhyastha vidhyulekhe va bhasvara… Like a blue flame of light, prana moves between the ninth and fourteenth ring of the vertebral column. Heart is only the main switch. If this blue flame is off, then there is no life.” A very vital lesson, indeed, from the Divine Physician. Swami had the right answers. But, at no point of time, did Swami emphasize that He knew everything. Since we got trained at a Cancer Institution in Bangalore, Bhagavan called the doctors there for an interview. He asked the group of doctors as to what caused cancer. There were generic answers like ‘tobacco’ and ‘smoking’, but Swami was not happy with the replies. He then said, “Children don’t smoke, yet they get cancer. You are all learned. You know a lot in this field. But, in my opinion, cancer is caused by sugar.” Here was the Lord, the Supreme Specialist, humbling Himself before a group of surgeons and specialists. Many of them were not devotees of Bhagavan. Probably, that was the reason why Swami used the words ‘in my opinion’. Tears welled up in my eyes. Swami always says ‘Speak obligingly. You may not always be able to oblige a person but you can always speak obligingly.’ And here He was, talking so lovingly, and with concern for everyone. Another important lesson Bhagavan demonstrated before my eyes! My life, thenceforth, has been an endeavor to live up to the Ideal Swami Himself charted for me. Where do I begin, and how do I wrap up the endless tales of His infinite glory? I can only say with utmost gratitude and confidence – Whatever I am today, I am because of Him. Without Him I am a zero. He always guides me, guards me and protects me as the apple of His eye. Every second I feel His presence. For, is it not He, the indweller within each and every one of us, who is holding the reigns of our souls, and taking us along the journey of life?